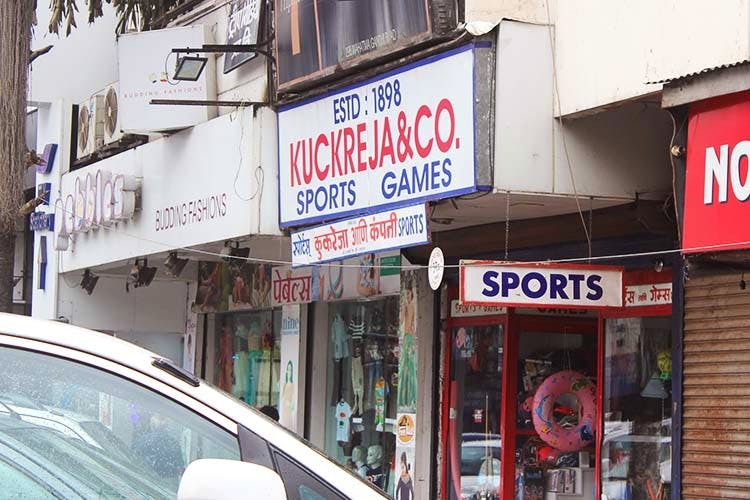 120-year-old Kuckreja & Company at MG Road is the most trusted and undoubtedly the oldest name in providers of sporting goods, attire and equipment at fairly reasonable prices. At Kuckreja’s, near Budhani Brothers, nothing has really changed in the past 100 years. Very traditional, down-to-earth, this one-storied store sells local and international sports equipment and clothing, across price ranges, under one roof. If you’re a cricketer looking for durable and sustainable products, this is the place to be! From popular willow cricket bats to high-end Adidas, Puma and Kookaburra bats, Kuckreja boasts of its varied collection, starting from INR 899 to as high as INR 12,000. Do check out their range of helmets, gloves, leg pads, jockstrap and sun hats, starting at INR 499. Another major hit at Kuckreja’s is their collection of swimwear. Shop for an entire swimming kit with goggles, swim caps, nose clips, bodysuits and nylon trunks by different brands including Speedo, Viva and more, starting at INR 2,700. Football fans, get your favourite team’s or player’s jerseys out here for under INR 1,000. We loved their latest collection of footballs by Cosco, Nivia and Adidas, starting at INR 1,200. The store and its staff believe in diversification and giving equal importance to every sports. We found an array of products and equipment for tennis, badminton, hockey, cycling and basketball. From rackets starting at INR 299 to golf sticks for INR 255 and basketball hoops for INR 599, we found everything awesome at Kuckreja & Company. Kuckreja & Company excels in trophy and plate engraving. So if you have a college fest coming up and you need to get a large number of trophies made, head to this store and place an order!